Woot! As of today, I have been blogging for one month! For some reason, it seems like a lot longer than that. For a few years now, I've always wanted to start a blog. But never actually took the initiative to make one. Until now! This is so exciting! Being new to blogging, this feels like a new relationship. Getting to know each other, learn to love and or hate each other... oh lawd, I hope I don't have a love/hate relationship with my blog. That wouldn't be good for anyone. So, now that my one month anniversary is here, I am having a giveaway! And.. yeah, go figure it's my first giveaway. 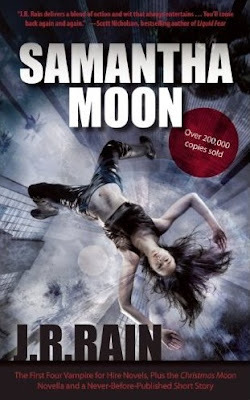 So, a week or so ago, I read an ARC for "Samantha Moon" by J.R. Rain and posted my review. When I read this ARC, I fell in love with it! So, I emailed the publisher and asked if I could host a giveaway for the ARC to one of my followers. I got a reply back and the publisher did me one better! They sent me an actual copy of the book! I am incredibly excited to give this one away, as I'm sure you'll love it as much as I did! Hopefully! hehe. I love how happy and upbeat your blog is! I'm surprised you've only been blogging for a month because it's so developed! And I really love your music choices! We definitely have the same taste because I know 95% of the songs lol! Sometimes I'll leave your blog up just so I can listen to the music hehe! I gotta agree with Shae, I love how it's all happy and bright in here, something mine will never be >.< Lol Your personality shows in your blog and that's what I like most about it. Wow! Only a month? You already know I'm very impressed with your blog design (hee hee) I agree with the others above, your personality really shines here! Great job so far Ana! I love the way you rate things! The things on the side bar is so clever. I also really like the layout! I like how the way you rate things ties in with the title of your blog. First of all, love the design its so bright and cheery, second I read a couple of your reviews and they were done very well. And it seems we have the same taste in books as well :). Congrats on one month of blogging, its so much fun. Thanks, thats great :) Always love talking to people with the same book interest as me!